Along with my colleague Councillor Tom Ferguson I have called for any money received from the sale of the infants' school at St Mary's to be re-invested in the soon to be single-site school. A number of concerns were raised about the practicalities of the move and I think that it is to be regretted that the Council's Administration pushed through the proposal rather than listen to the voices of the people of Lochee. It was also strange that this approach is in marked contrast to the view which they took with regard to Law Nursery where we have the remarkable, and possibly illegal, 'informal' consultation going on. Labour Councillors covering the catchment area of St Mary's Primary School in Lochee have called a significant proportion of any capital receipt realised by the sale of the infants' school to be re-invested in St Mary's Primary School. Councillor Tom Ferguson and Councillor Richard McCready support efforts to locate the school on a single site. They are concerned that issues raised by parents have not been listened to in this process. Both Councillor Ferguson and Councillor McCready are writing to the Director of Education suggesting that any capital receipt for the infants' school should be re-invested in St Mary's Primary. I have grave concerns about cuts at Dundee College. I have been approached by a number of constituents, both staff and students, who were concerned about the impact that this will have on them. On Thursday I met with Dundee College Principal, Christina Potter. I have also been in contact with the trade unions at the College to hear their views. I had a very constructive meeting with the Principal of Dundee College, Christina Potter. I have every sympathy for her position she has to deal with cuts which have been imposed on the College by the Scottish Government. I sought reassurance that students already studying courses would not be disadvantaged. I was happy with the response I got which was that every effort is being made to ensure that students are appropriately placed. Obviously, the devil is in the detail here and it is too early to say whether all students will be happy with the outcome of these proposals. I want staff changes to be carried out without compulsory redundancies. These are difficult times for many staff at the College and I hope that they will be treated fairly. The Principal highlighted to me that there is a genuine consultation process underway and I know that the trade unions and the workforce will play their part in process. I think that the Further Education sector can often be undervalued. I believe that Dundee College will play a key role in the economic recovery in Dundee and beyond. I know that Labour would have colleges playing a key role in the Scottish Future Jobs Fund and in the apprenticeship guarantee. It is disappointing that funding changes imposed by the Scottish Government will have a detrimental impact on the work of Dundee College. I know that Dundee College does a great job for students in Dundee and makes a major contribution to the economic life of the city and to educational attainment in the city. Dundee Fairtrade Forum is marking Fairtrade Fortnight by launching its new website. 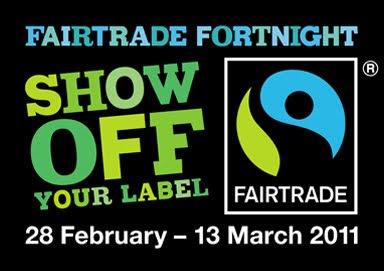 The theme of Fairtrade Fortnight this year Show Off Your Label. Dundee Fairtrade Foundation will be doing its bit by having an exhibition on display at the Central Library in the Wellgate and by launching its new website. There are a variety of events going on in Dundee's schools, colleges, universities, faith communities and right across Dundee during Fairtrade Fortnight. 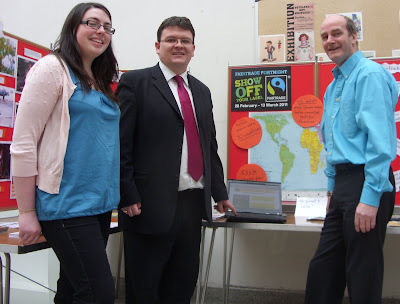 I am the Convener of the Dundee Fairtrade Forum and I think that it is important to mark Fairtrade Fortnight. This year's theme is Show Off Your Label and is about Fairtrade in the textile industry. In Dundee this has a particular echo as many generations of Dundonians, especially women, were exploited in the textile industry in the jute mills of Dundee. We do have a duty to ask the question about where our clothes are made and how they are made and how the workforce is treated where they are made. I am really pleased that we are having the chance to launch the Dundee Fairtrade Forum's new website to coincide with Fairtrade Fortnight. The website address is http://www.ftfdundee.comli.com/index.htm This is an excellent resource for promoting Fairtrade in the city and beyond. Dundee was Scotland's first Fairtrade City, we need to work hard to ensure that Dundee remains at the forefront of the campaign for Fairtrade and the campaign to make Scotland a Fairtrade Nation. The photograph shows Kerry Daly a student on placement at the OneWorldCentre, myself and Robert Roshier who designed the website. On Tuesday evening I attended Mass at St Andrew's Cathedral to mark the 30th anniversary of Bishop Vincent Logan as Bishop of Dunkeld. The Cathedral was absolutely packed and it was good to see so many people supporting Bishop Logan. Bishop Vincent's work over the years was marked and special mention was taken of his work in the field of education. Bishop Vincent has submitted his resignation. Like everyone who was there tonight I echo Cardinal O'Brien's wish that Bishop Vincent enjoys a long and healthy retirement. I was at the Civic Reception which celebrated the White Ribbon campaign today. The White Ribbon Campaign is a campaign against violence against women. I have taken the white ribbon pledge. There is no excuse for violence against women. We can all do something about it. We need to challenge the culture which allows violence against women. The White Ribbon campaign is an important development, men should consider signing up to this campaign. The Courier's report and photograph can be found here. At the City Council's Education Committee there was supposed to be a debate about the future of Law Nursery. The report which should have been discussed can be found here. What appeared to be the views of the Education Convener can be found here. Many parents have contacted me over the past week to highlight their concerns about this proposal. I have read the report and I have to say that I was far from convinced that this was the way forward. Inexplicably, this report was pulled from the agenda at the last minute. When I say inexplicably I suspect that it is explicable but that the explanation has nothing to education and everything to do with trying to protect the SNP's position. I was disappointed that we were denied the Education Convener's explanation of how this 'really exciting proposal' would have a 'positive impact on children's education.' Indeed the Convener refused to explain why this report had been pulled from the agenda, and also refused to give any indication of whether this proposal has been withdrawn permanently or whether it will resurface at some point in the future. Labour Education Spokesperson, Councillor Laurie Bidwell said, 'This is a humiliating climb down by the SNP administration. Last week I was at the annual Sport Dundee Awards which had been postponed due to snow in early December. It was great to see the work of so many people recognised. I was delighted to see a wide range of sports win awards from gymnastics to Gaelic football. Sport plays an important role in society in Dundee. It is right that the people who give up their time to support sports whether as officials or coaches or who perform either as a team or as an individual are recognised. Well done to everyone who received an award. I welcome the setting up of a 'Commission on Living Standards' by the Resolution Foundation. I have highlighted that inflation and rises in the cost of living are having a major impact on families in Dundee. The Courier has rightly been highlighting concerns about the cost of fuel and the impact of inflation. I share these concerns and I know that people right across Dundee share these concerns. I am pleased that the Resolution Foundation is looking at the issue through its 'Commission on Living Standards'. This commission will report next year but I hope that both the UK and Scottish Government take action before then. Government at all levels has an important role to play in ensuring that families are not hit hard by inflation. It is important that everyone works together to ensure that families are treated fairly and that work pays for families. People in Dundee are concerned about the cost of living and I will be looking for ways to reassure them and campaign for fairness. The recent VAT rise has had a particularly harsh impact on low and middle income families who spend more of their income. Making a real difference to hard working families is important. Labour leader Ed Miliband has drawn attention to the crisis in living standards. He rightly highlights the impact that this is having on families with children. He is campaigning for fairness. I welcome the review which has taken place into how Dundee City Council dealt with the severe winter weather in November, December and into January. I'm pleased that my particular concern for the welfare of sheltered tenants is being taken on board. I was pleased to be able to attend the briefing today which was organised by the Chief Executive for elected members. It was good to hear about what officers of the council had done during the recent bad weather. It was also good to have the opportunity as an elected representative to pass on the many concerns raised with me by constituents and others across the city. The Chief Executive has undertaken to take on board a number of comments and issues which were raised and to feed these comments into a review of the council's policy which will be considered before next winter. Firstly, I would want to praise the work done by council employees and others in terrible conditions. Many of them went above and beyond the call of duty. But there are lessons to learnt. There needs to clarity in the public's mind about what they can expect from the council. On a number of occasions I have raised concerns about sheltered housing residents who were virtual prisoners in their own home for a number of weeks. The council cleared the entrance to sheltered housing lounges but did not clear the footpaths in surrounding streets. This needs to be looked at. For a number of sheltered lounges Christmas was cancelled as a result of this. In general the council needs to review how often they can expect severe winters like the one we faced this year. Was it a blip or is it part of a trend towards harsher winters? If it is part of a trend then the council, the Scottish Government and indeed the UK Government need to be devoting more resources to winter maintenance. In terms of roads maintenance the council needs to deal with the many potholes which are a result of the recent weather. The council needs to consider whether it is right to spend less on repairs or spend more and have repairs that are genuine and long-lasting.